The report comes just days after trouble at Pittodrie at the end of the Aberdeen-Rangers match. The review was commissioned by the Chief Constable of Police Scotland and carried out by Deputy Chief Constable Mark Roberts, of South Yorkshire Police and the National Police Chiefs’ Council lead for football policing. Its publication came just days after trouble marred the end of Aberdeen FC’s 1-1 draw with Rangers in their Scottish Cup quarter-final match. As fans filed out of Pittodrie following the stalemate on Sunday, fans were seen throwing seats at opposing supporters. Meanwhile, five men and a woman were arrested in connection with “disorder-related offences” and the alleged use of pyrotechnics. This followed an incident at the Hibs-Celtic game at Easter Road the day before, when a fan threw a Buckfast bottle at the visiting forward Scott Sinclair. And Scottish Justice Secretary Humza Yousaf vowed “nothing was off the table” when it came to dealing with thuggish behaviour by fans when asked to comment ahead of the report being issued. Clubs in the north and north-east have pledged to take on board the recommendations. However representatives from the region’s senior clubs were all keen to stress they already had a very positive relationship with the police. Very few of the case studies cited in the report referenced grounds in the north and north-east. However, it does make reference to tickets being over-sold for Rangers’ visit to Fraserburgh FC in the fourth round of the Scottish Cup last year. About 150 away fans were turned away from Bellslea Park on January 31, 2018 despite claiming to have genuine tickets. An inquiry was later launched by the Broch organisation, amid claims that counterfeit tickets were sold, while the SFA also got involved. Ross County FC’s operations and safety manager is a former veteran of the force and said he was acutely aware of the importance of getting football policing right. David O’Connor, who served in the then Northern Constabulary for more than 30 years, said: “I’m a retired policeman, but was heavily involved in policing at Inverness Caley Thistle and I’m now involved at Ross County. Graham Tatters, chairman at Elgin City FC, said the club had a great relationship with the police and its matchday officers and said he did not envisage there would be anything in the report that would be a “cause for concern” for The Black and Whites. Peterhead FC could not be reached for comment. Football fans have said their experience with police on match days is a broadly positive one. 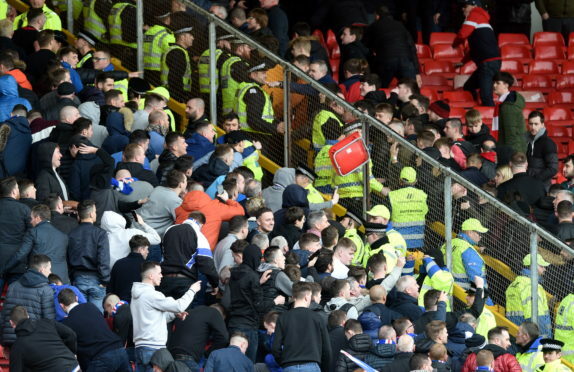 Aberdeen FC supporters clubs have said they generally feel safe at games and believe the force does a good job of ensuring any trouble that breaks out is quickly subdued. Kevin Angus, of the Dyce Reds club, has been going to Pittodrie and away games for about 20 years. And he says the experience is a far safer one than it was when he first started attending. Mr Angus attributed that to the increased likelihood of trouble given the number of supporters involved, and the intense rivalries between the Dons and the Old Firm clubs. He added: “There’s a bit of aggro which appears to be coming back, but it just seems to be isolated incidents. It’s getting a lot of coverage though. “I think these days there’s definitely less trouble than when I first started going and I think that’s to do with the police – they have a lot more control over what happens at the games now. Kevin Tracy, of Baanchory Reds, attended the game on Sunday where trouble broke out. He said: “I will say for all clubs throwing objects seems to be a big problem that needs to be dealt with. “There were lots of coins being thrown from the away end on Sunday and obviously there were the seats too. The Press and Journal attempted to contact supporters of other clubs but none could be reached for comment.